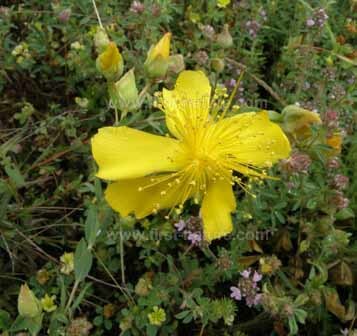 There are so many species and subspecies of Hypericum in the wild that it is easy to be confused - except by this one. The normal size of Hypericum flowers in the wild is up to 2-3cm but with Hypericum olympicum they are much larger - up to 5.5cm in diameter. This lovely flower blooms in meadows, dry and rocky places and also on roadsides. The specimen above was photographed in the foothills of the Rhodopi Mountains in Bulgaria in mid June.